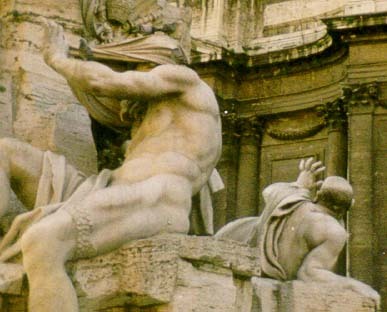 The story goes that the Nile River is utterly aghast at the facade of the church of Sant'Agnese in Agona, designed by Bernini's rival Borromini, and thus covers its head since it cannot even bear to look. The Plate River is holding up its arm, ostensibly to protect its gaze from the sight of the church facade, or perhaps to protect its body from the apparent toppling of the tower from above the "unstable" concave facade. 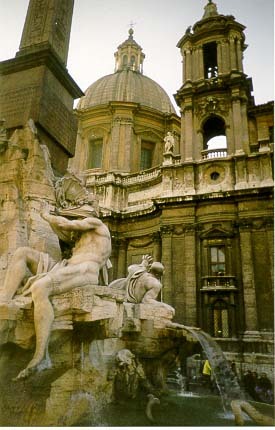 This, however, is an urban legend of Rome, since work on the church began in 1652, one year after the sculpture was already in place. The concave church facade was itself a smart design which accounted for the limited space of the long but narrow piazza. A traditional convex facade would have significantly portruded into the limited frontal space, so Borromini instead submitted a design which sank into the background and left the open feeling of the piazza intact. One can't help but notice the sculpture's apparent reaction to the building closest to it, though, which makes even this quick side trip in Rome a dramatic event.